“I believe that we will win, I believe that we will win, I believe that we will win ...” Over and over. And the thing is, as a country we did believe it, almost. Because we’re Americans and how often are we the underdogs at anything? Even when our own coach thinks we don’t have a chance, even when one of best strikers Jozy Altidore is out, there was hope we could beat Belgium. Yesterday at Geno’s restaurant, whole families, bros and people who probably called into work sick all gathered together decked out in red, white and blue to cheer on the home team. With the sun shining brightly, people cheered for every minute. Every time we nearly made a goal there was clapping, every time a call went our way there was hooting, every time goalkeeper Tim Howard deflected the ball — which appeared to be every other second — we shouted in unison. In general, the atmosphere was positive, no hollers about how much Belgium sucked or our distaste for waffles. 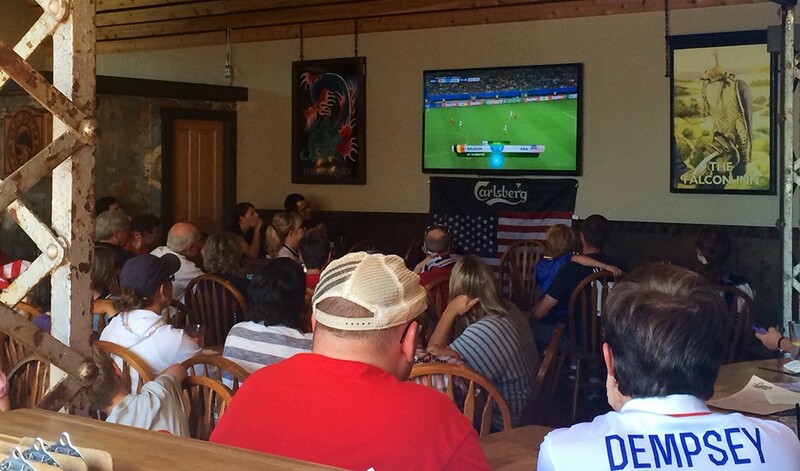 Silence (and despair) fell over the Geno's crowd watching the USA vs. Belgium World Cup match yesterday. When that second Belgian goal ripped through during overtime, though, things became positively forlorn. No one spoke. Our team came back as 19-year-old Julian Green hammered in one goal, but to no avail. (Inlander’s own) @danieltwalters Expecting this game to look like we barely pulled it out somehow, then Howard's skull is crushed by The Mountain. My heart still hurts. I wanted us to defeat Belgium so bad. But as the dust settles one day later, the exciting thing here is that after surviving the Group of Death we made the Top 16 in the world, and that is nothing to be embarrassed about. In a World Cup that saw traditional powerhouses like Spain, Italy and England not even clear their groups, we persevered. Americans don’t care as much about soccer as the rest of the world. When Mexico or Brazil wins a match the entire country takes the next day off due to hangover. It is not ingrained in us. But as ratings for this World Cup have blasted past the homegrown sports TV ratings and as Major League Soccer continues to grow and draw crowds, it appears change is on the horizon. So who’s still in this? Brazil, Argentina, Germany (Go Deutschland!) and Costa Rica are who I’m predicting for the Final 4, but absolutely anything can happen. The Top 8 will play Friday and Saturday, and even though USA is out, I bet people will still watch. The final match will be played Sunday, July 13. Here’s to 2018 and the great Tim Howard!